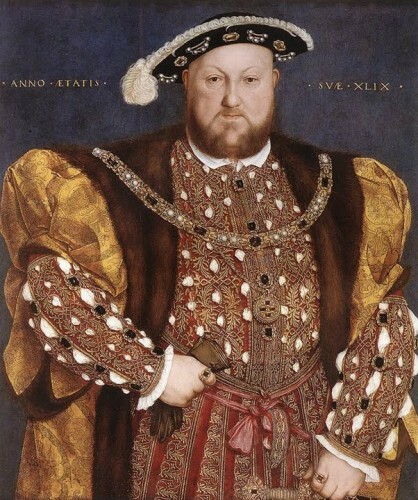 The infamous painting of Henry VIII by Hans Holbein is one of the best-known images in English history. Instantly recognisable in the modern era, the portrait successfully exemplifies the authority and power of the Tudor king. It still springs to mind at the mention of his name, five hundred years on from the painting’s completion. However, in the early modern period, portraits had political dimensions beyond that of mere representation. The Florentine humanist Leon Battista Alberti contended in the fifteenth-century that ‘painting possesses a truly divine power which…makes the absent present’. (1) Early modern portraits of sovereigns were employed precisely to this end. Frequently perceived as embodying the essential or ideal character of the person they depicted, they provided vital tools in a sovereign’s armoury. (2) Moreover they enabled the sovereign to determine their own power and image, potentially idealising themselves for political gain. Here we will consider how the portraits of sovereigns supported political negotiation with their subjects, their use by elites to project status and loyalty, and their important role in assisting diplomacy between courts. Ultimately, whether successfully or unsuccessfully employed, the value of portraits of sovereigns in the early modern period as political tools seems to have been well-established, with political aims almost invariably playing a part in the commissioning of the portraits themselves. For portraits to function as political symbols beyond their initial exchange, however, they had to closely resemble the sitters they depicted. Portraits used in diplomacy were routinely expected to be displayed by the receiver, and consequently would have been viewed by visiting dignitaries. (8) Significantly, the closer a portrait of a sovereign was to its sitter’s genuine appearance, the closer the relationship was perceived to be. (9) A portrait in this sense might be seen to resemble our modern day concept of a “passport photograph”. (10) Although identification was prioritised over artistry, political statements of fealty and status were still integral to the process. (11) Not only were portraits crucial for forging and maintaining relationships on a political level, but they were also central to making these relationships evident to other sovereigns by means of their ambassadors. This seemingly demonstrated how well-connected a sovereign was, thus supporting the implication that an alliance with them would be valuable. The notion of a sovereign portrait as a marker of allegiance was not limited to sovereigns themselves. Portraits of sovereigns could similarly function as political tools throughout early modern elite society, which was dominated by court culture and politics. They were frequently used to this effect in interior decoration. Roy Strong has argued how, for most Elizabethans, paintings were unlikely to have ever been perceived as works of art, seen instead only as demonstrative of social status. (12) Indeed, at Hardwick Hall, Bess, Countess of Shrewsbury used portraiture as a celebration of her own status by choosing to display her genealogical affiliation with royalty. In the long gallery at Theobalds, William Cecil displayed portraits of English and European sovereigns as a symbol of his political rank, with a separate, lower gallery housing portraits of his own family. (13) Bess, however, did something markedly different. At her Derbyshire home she placed portraits of the Cavendish family alongside those of the English and Scottish sovereigns to which they were related, clearly interspersing the two and thus evidencing her social status to the distinguished guests she received. (14) As a result, it is clear that portraits of sovereigns constituted political statements beyond an immediately royal setting, lending rank to those who were able to display them. Consequently, though it may not be immediately obvious today, there were many ways in which portraits of sovereigns might have constituted political tools across early modern court society. The early modern paradigm is likely to have conceived art in a very different sense to the modern mind. Though art was by no means unappreciated, it is questionable whether the concept of ‘art for art’s sake’ would have been felt by contemporaries. Early modern art and particularly sovereign portraiture typically had a clear purpose: whether commemorative, idealised or allegorical. In the effected world of the early modern court where gesture, dress and all manner of visual presentation had scope to project political messages, it seems natural that something as visual as portraiture could never be free of political motivations. However, this is not to say that portraits were always successfully employed as political tools. Though this piece is perhaps too short to consider the multifarious ways in which portraits could be problematic, they could indeed be contentious, or created with such allegorical complexity and symbolism that they might confound the viewer. Notably, though they might “make the absent present” for a time, they could not replace human interaction; the renowned case of Henry VIII’s eventual refusal of Anne of Cleves when previously enamoured by her portrait is testament to this. (15) Portraits were undoubtedly imagined as political tools, seemingly symbolising a diplomatic currency between sovereigns and a means of negotiating disputes within their own courts. Yet, it is debatable whether the finely-tuned political messages they might wish to convey were always understood, and whether the political value of portraits of sovereigns was always fully realised. (1)L. B. Alberti, On Painting and Sculpture, trans. C. Grayson (London, 1972) p.63 cited in T. Sowerby, ‘“A memorial and pledge of faith”: portraiture and early modern diplomatic culture”, English Historical Review, Vol. 129, No. 537 (2014) pp.296-331, p.296. (2)J. Woodall (ed.) Portraiture: Facing the Subject, (Manchester, 1997) p.16. (3)A. Riehl, The Face of Queenship: Early Modern Representations of Elizabeth I, (Basingstoke, 2010) p.17. (5)L. Campbell, Renaissance Portraits: European Portrait Painting in the Fourteenth, Fifteenth and Sixteenth Centuries, (London, 1990) p.194. (6)R. Lesaffer, ‘Amicitia in Renaissance peace and alliance treaties 1450-1530’, Journal of the History of International Law, Vol. 4 (2000) pp.77-99, p.78. (7)A. Clarke, S. Doran and D. Starkey (eds.) Henry VIII: Man and Monarch, (London, 2009) p.99. (10)E. van Alphen, ‘Facing defacement. “Models” and Marlene Dumas’s intervention in western art’, in M. Dumas Models (Frankfurt, 1995) cited in Woodall, Portraiture, p.16. (12)R. Strong, The English Icon: Elizabethan and Jacobean Portraiture (London, 1969) p.44. (13)J. Peacock, ‘The politics of portraiture’ in K. Sharpe and P. Lake (eds.) Culture and Politics in Early Stuart England (London, 1994) pp.199-228, p.217. (15)Alberti, On Painting, p.63 cited in Sowerby, ‘A memorial’, p.269.